I first attended SAWG in 2007. At the time, I couldn't even call myself a Greenhorn Farmer. I'd never raised nor butchered any livestock but I'd done all the prerequisite reading and visiting. I'd read the Omnivore's Dilemma, all of Salatin's books and visited Salatin's place. I was considering the internship route but felt a strong desire to dive in and make a go with my own farm business. That 2007 SAWG Conference in Louisville was just what I needed, a deep dive into farming specifics and a connection to a network of likeminded farmers. I still remember my excitement when I came across the SAWG flier at a local bakery. I wanted to focus on pastured poultry and all the stars aligned. 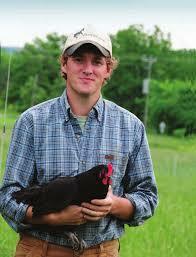 One of the pre-conference courses focused on pastured poultry. I soaked it all in that year and left the conference raring to go. That first year my wife and I raised 700 broilers and I can't tell you how many times I referred to my notes from the SAWG Conference. Seven years later we're still going strong. In 2013 we'll raise 10,000 broilers, 175 hogs, 40 beef, and 400 turkeys and honestly, it’s hard to imagine our success without SAWG. We've attended SAWG every year since 2007 and each year we learn more and expand our network. Thank you SAWG!